Neal is working with the Provo architects on the design of the new museum building. I stick my nose over his should every once and a while to see how things are going. Inevitably, I get a lecture for my troubles: offices should be over here for this reason, the entrance should be inviting and open, and if you imagine the center of a circle just here the rest of the building should flow around it to create a building inviting exploration. I’m not complaining. I don’t know anything about architecture and I’m happy to learn. Last night’s lesson, however, was abstract. Neal was explaining how the museum design is starting to look like a shipwreck. He diagrammed the stages of the wrecking and finally morphed it into the building design. I was skeptical. He was clearly inventing a story that didn’t exist, like Michelangelo seeing things in the rocks. Look at this grouping of chairs in the middle, that doesn’t look like a ballast mound to you? What about walls of the gift shop, that’s clearly the bow of the ship. Yes, I understand that you see these things, but I see a group of chairs and some curved walls. What you are doing is like modern art, I said, it doesn’t matter what the artist put there – it is whatever you imagine it to be. Well that started it. An architect’s building should be a piece of art, countered Neal. 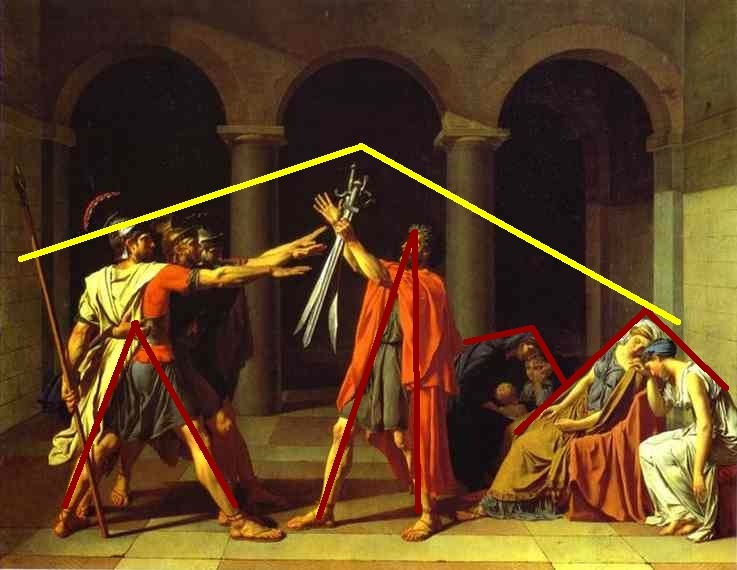 Modern art can be diagrammed into simple lines that reveal they follow the composition tenements of the classics (understand we are talking about Western civilization here). 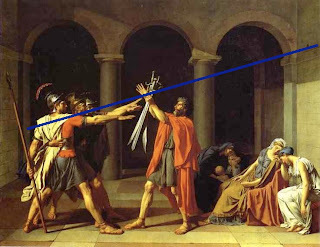 Take the Oath of the Horatii. A classic piece, cut into a diagonal by color – dark at the top, light at the bottom. In fact, because it’s a classic piece it’s very literal – the diagonal line is actually drawn into the wall design at the top right corner. The painting is inundated with triangles, and in fact the whole composition is triangular, from the handle of the swords down. This weighs the picture down to the bottom of the canvas. These are the basic rules of classic composition. Diagonal line cut across, divided more with shading and coloring than composition – dark on top, light on the bottom. Triangles every where with an overall triangle from the tip of the candle down, weighing the canvas toward the bottom of the frame. I made him do this exercise a number of times. I’m going to work on breaking things down into diagrams. It seems like good practice to get the creative juices flowing. I’m a chairs and curved walls type of person, but with a little imagination anything is possible.